As the part time receptionist of OlyCurl, I am usually the first face you see when you walk in the door. I have always thought of myself as a curly girl, until I met wonderful clients with Botticelli curls, and corkscrew curls. I learned that truthfully, my hair was wavy. While I regularly wear my hair down and in its natural wavy state, I typically always straighten my bangs. I have trichotillomania , which is a stress disorder that causes me to impulsively pull at my hair, specifically my eyebrows. Though I've gotten much better at drawing on eyebrows, it has been a huge insecurity of mine for years. Add in a large forehead, and you can see why I choose to hide behind bangs. Many clients come in with straightened bangs and beautiful curls. They will religiously pull out the straightening iron every morning to make sure their bangs look a specific way. Now transitioning from straight to curly bangs can be challenging. I have tried to transition and will have success on wash day and day two. But by day three, I pull out the straightening iron and fix up my bangs. It's not an easy transition, but it is so important for my hair's health that I make efforts and steps forward to toss the straightening iron and let my bangs embrace their naturally curly state. Here's a few clients who are trying to embrace curly bangs with me. Look at these lovely ladies and their incredible curly bangs! So, at the end of the day, what we are saying is to give curly bangs a chance! You never know how incredible your hair will look if you try something new. Embrace your curls, and face your fears when it comes to curly bangs. Take it from a notorious bang straightener; curly bangs are pretty awesome when given a chance! We would like to introduce you to Millie. If you have been to the salon in the past two weeks, you would have met her already! She is a very happy 3.5 year old hound mix rescue. She is a little male-shy but we hope that she will get over it soon with more exposure and desensitization. Our mailman Sam is very instrumental in her recovery! She is a rescue from South Dakota and this is her fourth home. No wonder she is a little shy initially! She is learning not to jump on people and is very good at sitting for treats. She has a collar that emits an audible beep to deter her barking. We hope her barking will get better using this device, as we know it can be intimidating walking in and having a dog run at you barking. For the most part, clients have been very excited to have Millie greet them and enjoy having her around. Dogs just have a way of bringing peace and calm to an environment! ​Please let us know if dogs make you uncomfortable in any way and we will make sure she is resting in her crate during your visit. She had grown weary of the same old curly triangle-y and unimpressive haircut. When curly hair is cut straight, there is no way to predict how that cut will turn out when worn curly. Sure, we are taught that the curls will spring up when they dry, but they don't teach us what we are supposed to do about it. Because of this, layers can leave a weight line (many people call it "The Shelf"), and a blunt cut can look like a pyramid. With results like these it is no wonder Curlies are leaving the salons. How can that be? Didn't her hair grow? While performing our 10-Point Curl Analysis, I made the observations that her hair was quite fine and also thinner on the top and sides. Upon further discussion, it was discovered that her mom also has thinning hair. This is, unfortunately, something I see quite often behind the chair. Female pattern balding is a real thing and I have discussed it at length in this blog post. The life cycle and subsequent shedding of her hair is not allowing her hair to grow much longer, or even past her shoulders. To date, I am not aware of any way to change the life cycle of your hair. When I received the photos along with the photos she submitted of herself, I was not sure I could deliver on her desires. I was fully prepared for the "manage her expectations" talk. She didn't look like she had enough hair to pull off the big volume and shape of the models in the photos. Once we started talking about ingredients and the products she was using, I realized that her hair was weighed down with a lot of lesser-quality oils and creams. This chokes out the moisture in the hair and does not allow water to penetrate and truly hydrate. Just look at the difference in her curls before and after. Her curls were stringy and limp. I even wondered if she had low porosity curls, but once we detoxed and removed all the build up I could tell her hair was thirsty and it drank up so much water. She actually had normal porosity. I seriously was surprised and thrilled at the same time! I couldn't have asked for a better conclusion to this two-hour service. Doesn't she look so much younger and vibrant? Have you been waiting years for the perfect cut? Or just to be listened to and understood by your hairstylist? Drop your comments below and don't forget to come see us. Working exclusively with curls for the past five years, Yukiko is the owner of OlyCurl, the only salon in Washington State that caters to Curls and Waves only. When she is not knee-deep in curls at the salon, or working on the business of salon ownership, she enjoys needlecrafts, reading, and playing with her pup. OlyCurl is a salon unlike any you have ever walked into before. As a school teacher who typically goes to a [chain salon] for a haircut once a year, the atmosphere, education, and service at OlyCurl blew my mind. I have the absolute pleasure of being a temporary receptionist for the month of July. As a teacher, I can tell you grammar rules, how to add, subtract, and whether the chicken or the egg came first. I can’t tell you the first thing about curly hair, other than mine usually looks like a rat’s nest by the time I get my annual cut in September. Yukiko and Julia are exceptionally knowledgeable in their craft and share their knowledge with such passion to all clients. Every client that comes into OlyCurl is so excited to see what magic Yukiko and Julia can whip up for them. They make sure each and every curl on your head is attended to, and will answer any and every question you have about curly hair and how to best care for it. 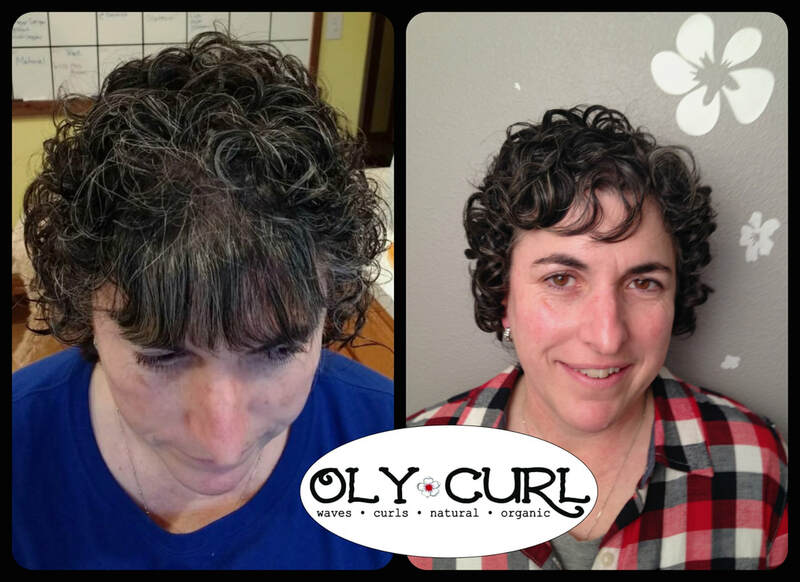 One of my favorite things about being a part of the OlyCurl experience this past month has been seeing new clients and the transformation their curls go through. An 8 year old girl came in with her mom. As Yukiko spoke with her mom about curls and the process they would be going through, the mom seemed a bit hesitant and skeptical. Could this haircut REALLY be different from the ones her daughter had experienced before? Would they both ACTUALLY love the final result? Or was this all just a waste of time and money? As Yukiko cut her hair, the curls began to show through, and her mom was starting to realize that this wasn’t just a hoax. The little girl wanted to wait for a big reveal, and wow, what a reveal it was! Yukiko washed her hair, and applied the necessary products for her curls to really take form and bounce beautifully. As Yukiko applied the clips in her hair for volume, her mom was absolutely amazed at the difference in her daughter’s hair. Once her hair was dried and Yukiko did the final touch ups, it was time for the big reveal. As she saw the final product, a huge smile lit up her face, and she proclaimed, “IT’S SO PRETTY!” Her mom was so pleased with the care and time put into her daughter’s hair and the end result gave her daughter confidence, which is exactly what Yukiko and Julia strive to do for each of their clients. The reason this story was so powerful to me is because of the little girl’s reaction before and after her appointment. She felt defeated by her hair, and at 8 years old, this is heart wrenching. We are taught at a young age that our appearance is so important, and that we must be aware of how we look to others. What OlyCurl does is teach us to love the hair we have, rather than fight with it, or destroy it by using straighteners and other heat treatments. Seeing her reaction after Yukiko worked with her hair was incredible. There is a reason clients love coming to OlyCurl and there are new clients interested in the services we provide every single day. The clients that walk through the door always have a smile on their face. 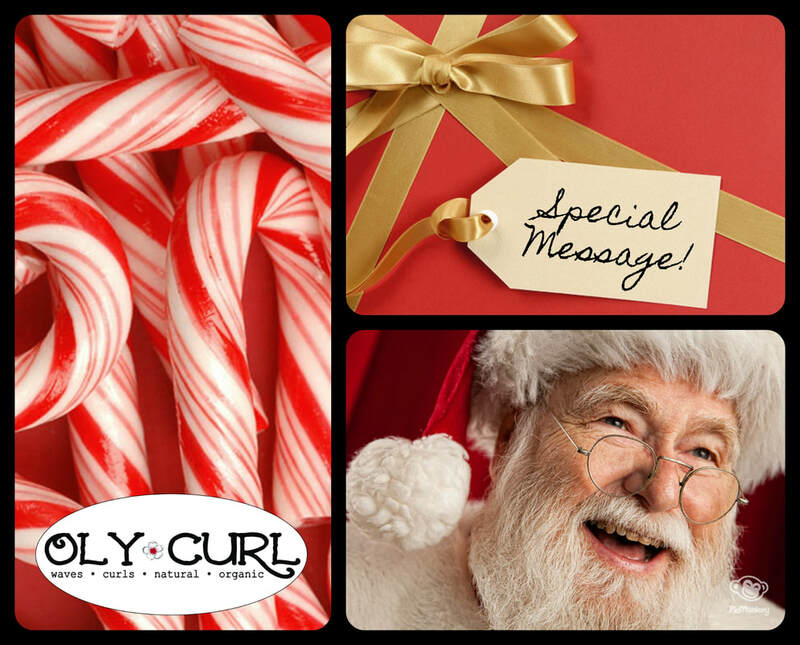 They know they are getting the best possible service, and when they are here at OlyCurl, they will walk away loving their curls. Anytime you start a new job, whether it is a temporary position, or a new career path, there is always the fear that you will mess up. The clients have been so patient, understanding, and welcoming to me as I learn the ins and outs of OlyCurl. There is a part of me that is sad I am only here for a short time, because I love seeing the relationships that have been built over the years between client and stylist. There is such a trust between our clients and our stylists at OlyCurl, that I don’t see when I am at a [chain salon]. In fact, the last time I left a [chain salon], I almost left in tears because the woman who cut my hair blow dried it and I looked like a frizzy ball! ​​The clients at OlyCurl always leave with a smile on their face, a spring in their step, and a bounce in their curl, because they know that Yukiko and Julia truly care about them. Yukiko and Julia remember their clients, and make a point to make sure OlyCurl is a stress-free, welcoming, and fun environment. 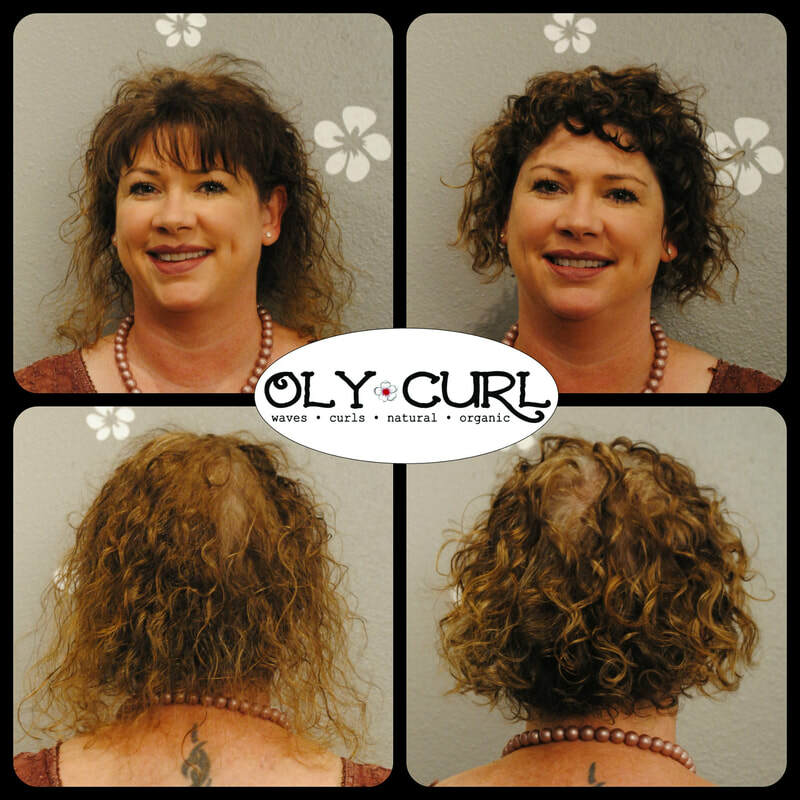 If you are looking for a salon that truly cares about you, your hair, and will make sure you walk away loving the way you look, OlyCurl is the place for you. To the clients that have made me feel so welcomed this past month, thank you! I hope to continue seeing all the beautiful curlies and burlies! We have had some unexpected cancellations for Tuesday, December 5th, for New Clients as well as Established Clients! Please Contact Us as soon as possible to snap up these opportunities! We are so excited to have Maile join us! She is a hard worker and is ready to learn all about curls and customer service. Want to know about us and what we do? Start Here. After that, if you are ready to take the plunge to the beginning of your curly hair journey, fill out our New Client contact form on this page. We look forward to hearing from you and rocking your curls and waves! In the salon we typically will dry clients under a hooded dryer, which saves time and is efficient during the course of our day. Occasionally, we will also diffuse clients' hair before putting them under the dryer. Different results are achieved through different drying methods (these are covered at your New Client appointment), and many clients will also air dry at home. We created a video to help you with diffusing at home. Don't have a diffuser at home? Not to worry! We carry them at the salon and they are $15. Pick one up today!